Polynesians are an ethnolinguistic group of closely related peoples who are native to Polynesia ( Polynesian Triangle), an expansive region of Oceania in the Pacific Ocean. They are part of the larger Austronesian ethnolinguistic group who trace their urheimat to Southeast Asia. They speak the Polynesian languages, a branch of the Oceanic subfamily of the Austronesian language family. There are an estimated 2 million ethnic Polynesians worldwide, the vast majority of whom inhabit independent Polynesian nation states ( Samoa, Niue, Cook Islands, Tonga and Tuvalu) and form minorities in Australia, Chile ( Easter Island), New Zealand, France ( French Polynesia and Wallis and Futuna), United Kingdom ( Pitcairn Islands) and the United States ( Hawaii and American Samoa). 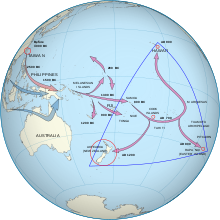 The Polynesian spread of colonization of the Pacific throughout the so-called Polynesian Triangle. Polynesians, including Samoans, Tongans, Niueans, Cook Islands Māori, Tahitian Mā'ohi, Hawaiian Māoli, Marquesans and New Zealand Māori, are a subset of the Austronesian peoples. They share the same origins as the indigenous peoples of Southeast Asia (especially the Philippines, Malaysia and eastern Indonesia), Madagascar  and Taiwan. This is supported by genetic,  linguistic  and archaeological evidence. 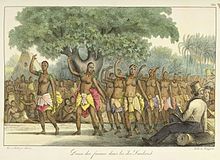 A popular theory among scholars and native Royal Polynesian Monarchy ( Tongan, Tahitian, Hawaiian; Monarchies) is that the genesis point from which Polynesia was finally populated was through the Polynesian Island archipelagos of Samoa (Sacred Center) . 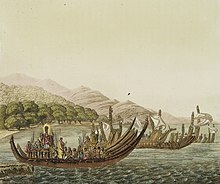 The Islands of Samoa are theorized to have been the gestation point from where which the initial roots of Polynesia patiently formulated over time, religion, philosophy, spirituality, language, Arts, culture and then spread forth through eastern Polynesia through the spreading of Samoa's Religion ( Aitu, Kahuna, Tafuna). 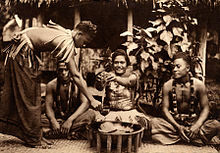 Through their Polynesian Aitu religion, the worship of animal, human deities and a pantheon of Gods and Demi-Gods which would grow exponentially in Eastern Polynesia, with the construction of monolithic Tiki Deities in Tahiti, Rapanui and the spread of the spiritual belief of Mana; a Polynesian spiritual life force which governs all living beings. 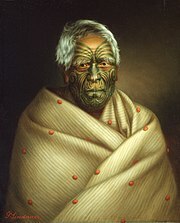 The last place to be settled by Polynesians was Aotearoa (New Zealand) estimated at around 1300AD. ^ a b "The Pacific Islands & New Zealand". ^ See page 80 in Landfalls of Paradise: Cruising Guide to the Pacific Islands, Earl R. Hinz & Jim Howard, University of Hawaii Press, 2006. ^ "Population of communities in Tuvalu". world-statistics.org. 11 April 2012. Retrieved 20 March 2016. ^ Wellington, Victoria University of (1 December 2017). "Arts, humanities and social sciences". victoria.ac.nz. Retrieved 14 April 2018. ^ Bellwood, Peter; Fox, James J.; Tryon, Darrell (2005). The Austronesians: historical and comparative perspectives. ISBN 9781920942854. ^ "Mitochondrial DNA Provides a Link between Polynesians and Indigenous Taiwanese". PLoS Biology. 3 (8): e281. 2005. doi: 10.1371/journal.pbio.0030281. ^ Kayser, M.; Brauer, S.; Weiss, G.; Underhill, P.; Roewer, L.; Schiefenhövel, W.; Stoneking, M. (2000). "Melanesian origin of Polynesian Y chromosomes". Current Biology. 10 (20): 1237–46. doi: 10.1016/S0960-9822(00)00734-X. PMID 11069104. ^ Dr. Martin Richards. "Climate Change and Postglacial Human Dispersals in Southeast Asia". Oxford Journals. Retrieved 1 January 2010. ^ Kayser, Manfred; Lao, Oscar; Saar, Kathrin; Brauer, Silke; Wang, Xingyu; Nürnberg, Peter; Trent, Ronald J.; Stoneking, Mark (2008). "Genome-wide analysis indicates more Asian than Melanesian ancestry of Polynesians". The American Journal of Human Genetics. 82 (1): 194–198. doi: 10.1016/j.ajhg.2007.09.010. PMC 2253960. PMID 18179899. ^ Friedlaender, Jonathan S.; Friedlaender, Françoise R.; Reed, Floyd A.; Kidd, Kenneth K.; Kidd, Judith R.; Chambers, Geoffrey K.; Lea, Rodney A.; et al. (2008). "The genetic structure of Pacific Islanders". PLoS Genetics. 4 (1): e19. doi: 10.1371/journal.pgen.0040019. PMC 2211537. PMID 18208337. ^ Kallen, Evelyn (1982-01-01). The Western Samoan Kinship Bridge: A Study in Migration, Social Change, and the New Ethnicity. Brill Archive. ISBN 978-9004065420. ^ Kuykendall, Ralph S. (1967). The Hawaiian Kingdom: 1874-1893, the Kalakaua dinasty. University of Hawaii Press. ISBN 9780870224331. ^ a b Pontus Skoglund; et al. (27 October 2016). "Genomic insights into the peopling of the Southwest Pacific". Nature. 538 (7626): 510–513. doi: 10.1038/nature19844. PMC 5515717. PMID 27698418. Retrieved 11 January 2017. ^ Kayser, M.; Brauer, S; Cordaux, R; Casto, A; Lao, O; Zhivotovsky, L. A.; Moyse-Faurie, C; Rutledge, R. B.; Schiefenhoevel, W; Gil, D; Lin, A. A.; Underhill, P. A.; Oefner, P. J.; Trent, R. J.; Stoneking, M (2006). "Melanesian and Asian Origins of Polynesians: MtDNA and Y Chromosome Gradients Across the Pacific" (PDF). Molecular Biology and Evolution. 23 (11): 2234–44. doi: 10.1093/molbev/msl093. PMID 16923821. ^ Skoglund, P; Posth, C; Sirak, K; Spriggs, M; Valentin, F; Bedford, S; Clark, GR; Reepmeyer, C; Petchey, F; Fernandes, D; Fu, Q; Harney, E; Lipson, M; Mallick, S; Novak, M; Rohland, N; Stewardson, K; Abdullah, S; Cox, MP; Friedlaender, FR; Friedlaender, JS; Kivisild, T; Koki, G; Kusuma, P; Merriwether, DA; Ricaut, FX; Wee, JT; Patterson, N; Krause, J; Pinhasi, R; Reich, D (3 October 2016). "Genomic insights into the peopling of the Southwest Pacific - Supplementary Note 1: The Teouma site / Supplementary Note 2: The Talasiu site". Nature. 538 (7626): 510–513. doi: 10.1038/nature19844. PMC 5515717. PMID 27698418. ^ Stride, Peter (10 January 2016). "Polynesian Bones". British Journal of Medicine and Medical Research. 16 (7): 1–9. doi: 10.9734/BJMMR/2016/25651. Retrieved 14 April 2018 – via ResearchGate. ^ Snowdon, Wendy; Malakellis, Mary; Millar, Lynne; Swinburn, Boyd (2014). "Ability of body mass index and waist circumference to identify risk factors for non-communicable disease in the Pacific Islands". Obesity Research & Clinical Practice. 8 (1): e36–45. doi: 10.1016/j.orcp.2012.06.005. PMID 24548575. ^ Sonny, Julian. "Why Polynesians Are Genetically Engineered To Be The Best Football Players In The World". elitedaily.com. Retrieved 14 April 2018. ^ "Why Pacific-island nations are so good at rugby". The Economist. Retrieved 14 April 2018.